To be honest, I didn’t really know what we were getting into way back when we agree to do our thing here at the X Games. I knew it would be a trip to the mountains, some great exposure to popular culture and some amazing contacts that might take our organization to the next level. What I didn’t understand was that we were entering into a hub of progressive thought and a way of life that is completely in tune with our organizational goals. 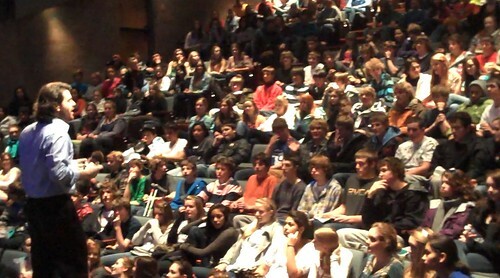 Here in the Roaring Fork valley, these students intrinsically get what we have come to teach them. And they want to take ACTION now. Every X Gamer we’ve run into asks all the right questions and want to do more to promote what ACE is doing. The folks at Disney and ESPN are doing it in their own companies, and challenging other to do more. In the midst of it all, we are emerging as the group that can present these kids with science that sticks in a fun and entertaining way. It has been a thrill to watch, especially given our position on the cutting edge of education. These athletes are exploring the boundaries of what is physically possible on snow, in the background ACE is doing the same....educating youth about what is possible. All it takes is a little imagination and the will to do something extraordinary.